Hello world from our new blog. Dolffanog Fawr is an 18th Century farmhouse that has recently been thoroughly renovated and converted into one of the finest small luxury accommodation establishments in Snowdonia. 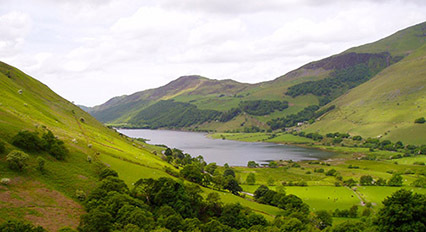 The house is situated in the heart of the stunning Tal-y-llyn valley. With views across sheep pasture to Tal-y-llyn lake, and Cadair Idris virtually rising from the back garden, you couldn’t wish for a more spectacular setting. We (Alex, Lorraine and our rugby mad son Morgan) pride ourselves on creating accommodation with a warm, relaxed atmosphere and an exceptionally high standard of comfort and cleanliness. All 4 ensuite rooms, named after local rivers, are simple yet stylish, neutrally decorated with woollen carpets, local artwork & Melin Tregwynt throws. Large beds with top end pocket sprung matresses & crisp Egyptian cotton together with clean Welsh mountain air make for a sound nights’ sleep.